Thank you to Teaching Textbooks for sponsoring this post and providing us with the newest 3.0 version to try. We’ve been happily using the 2.0 version for years and were excited to try the newest version. All opinions are 100% my own. As a homeschooling mom to eight kids, there are several important factors I take into consideration when choosing a curriculum for my large family. 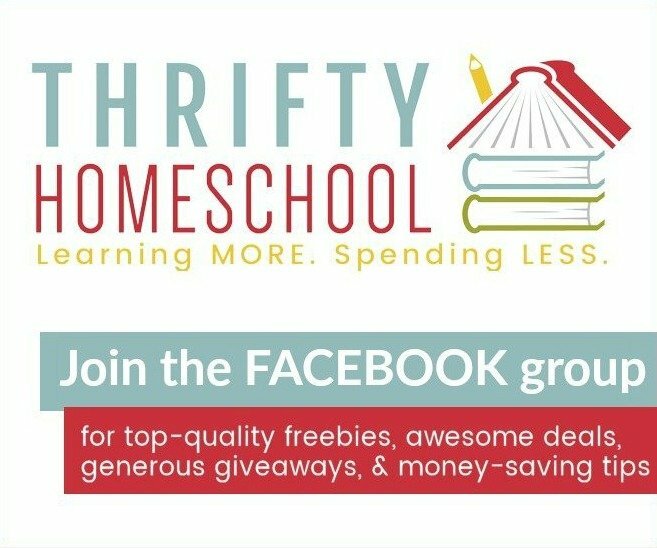 I have very specific needs and requirements when it comes to homeschool curriculum and there are many options out there that just don’t fit the bill for me. 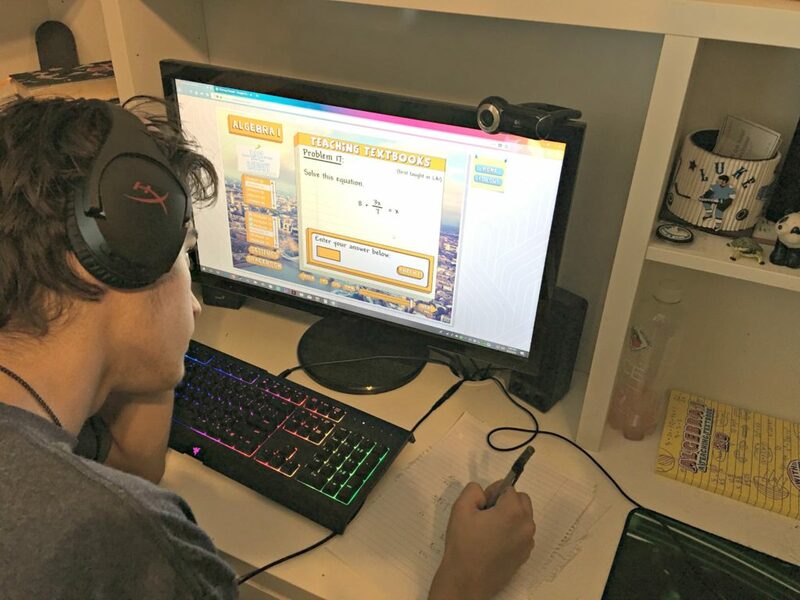 I’m happy to be able to say that we found a math curriculum that works for our big and busy family early on in our homeschool journey (I actually found it even before my oldest son was old enough for the first level that they offer, so I had to wait a couple years before we could actually use it). Teaching Textbooks checks off many of the boxes for what I look for in a homeschool curriculum. We have been using Teaching Textbooks 2.0, which is a physical version and includes CD-ROMS and a textbook (we just used the discs), for about 8 years now but have recently switched over to the new 3.0 subscription option which is an online version. All of the academic content is still the same with the 3.0 version, but the 3.0 option has some new features and can be used on multiple devices (more about that later on). The 3.0 version even includes an eBook version of the textbook. 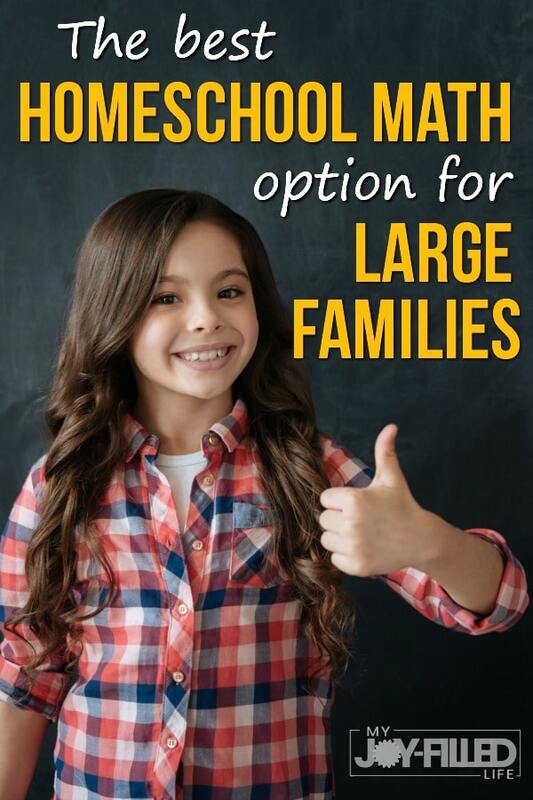 Keep reading to find out why Teaching Textbooks works for us and why I believe it’s the BEST homeschool math option for large families. Three quarters of my Teaching Textbooks crew working diligently on math. 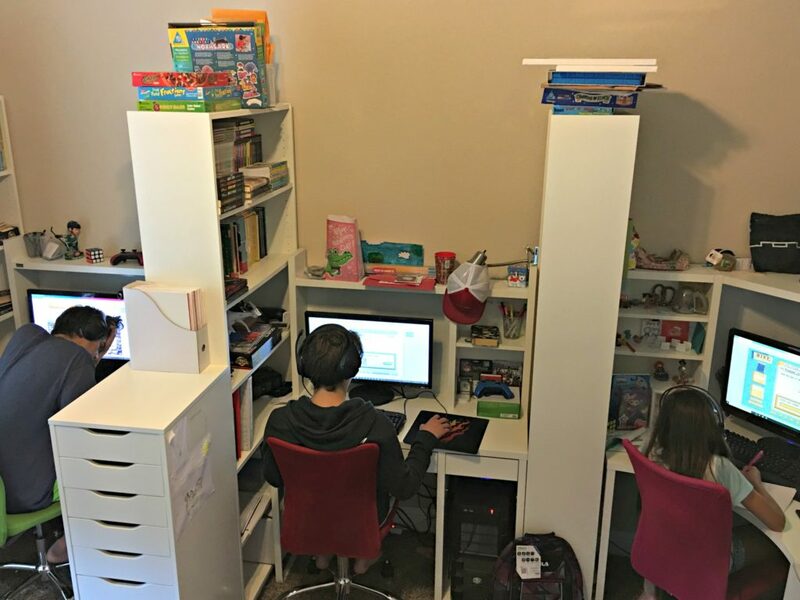 Wanna see our complete homeschool room setup? Click Here. Teaching Textbooks 2.0 and 3.0 are both affordable math options. When using 2.0 I could reuse the discs with subsequent children; because it is non-consumable, I didn’t have to purchase it again when my next child was ready for that level. The Teaching Textbook 3.0 subscription prices are very affordable considering it’s a whole year worth of math. But it gets even better for large families because they have a large-family discount plan. 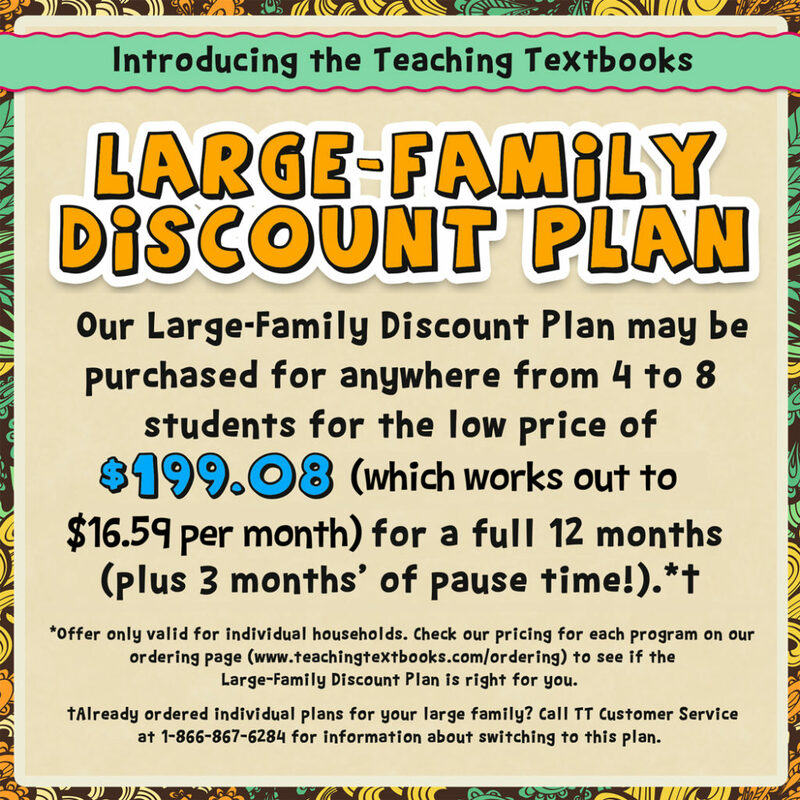 The large-family discount plan is for families with 4-8 students. You pay one price, $199.08, for 4-8 students in the same household. 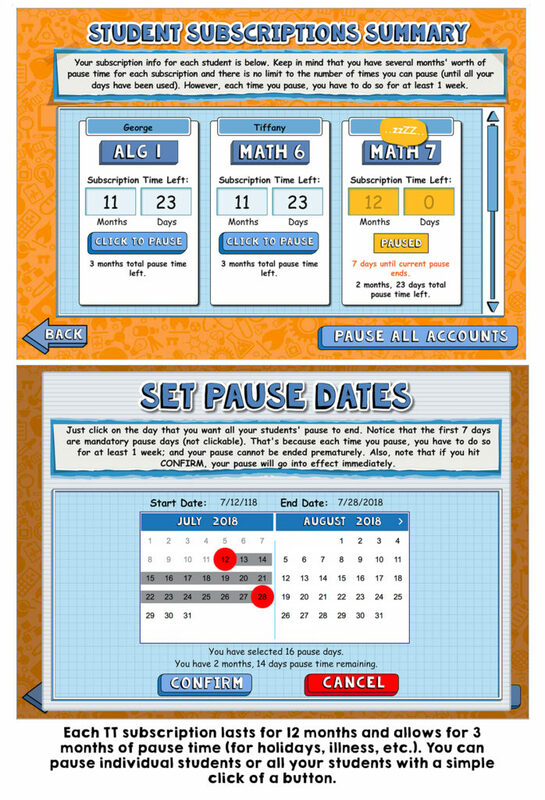 Each student on the subscription will get one level of math for the year. I have been switching more and more of our curriculum to digital if it’s available, because over time, I have found there are some really great benefits to digital curriculum. The biggest ones being that digital curriculum reduces the stuff and clutter in our house (which I don’t have time to maintain and keep up with) and digital curriculum won’t get lost or damaged (at least not as likely). I can’t tell you how many times my homeschool day went south because I can’t find a resource I needed for that day. My visions of working 1-on-1 with my kids and learning right along with them as we homeschooled went out the window when we added child #3 to our family; we were then out-numbered. And now with eight kids, 1-on-1 time doesn’t come easy at all. Of course I spend time teaching my children, but as they get older and become independent readers, I like to find curriculum that fosters that independence and also frees up time for me to spend with the younger children. With Teaching Textbooks, math instruction for me is minimal! I don’t do any of the teaching unless a child is struggling with a concept or topic and then my husband or I will go over the lesson with them that they are having trouble with. This isn’t needed often though because after every problem is answered (whether right or wrong), Teaching Textbooks gives the student the option to see how the problem is solved. I require my kids to do this if they get a problem wrong (before the second chance – more on that later too) or had trouble understanding the problem but managed to get it right. After the answer is given, students have the option to see how the problem is solved. Another thing Teaching Textbooks takes off my plate is grading! One of the things that takes up A LOT of my time when it comes to homeschooling is checking and grading my kids’ work. Not having to do this task for math is a HUGE time saver for me and I need to save time anywhere and any way I can! Even though Teaching Textbook does the grading for me, I am still able to go in and make some minor changes if necessary, like changing a problem from wrong to right and vice versa, or deleting a problem or lesson grade completely so the child can do it again. I do wish the grade book gave the parent a little bit more control by offering some additional features like changing the actual lesson grade and being able to click on the problems the child got wrong to see the problem and the answer the child gave. Another awesome feature would be to have the date a lesson was completed added to the grade book. 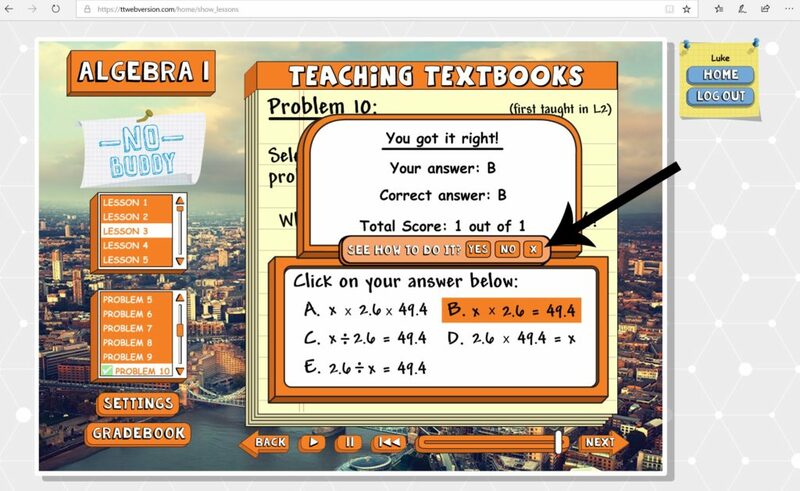 With Teaching Textbooks 3.0, you can do math anywhere! That’s helpful for our busy family because sometimes while waiting for a sibling at a music lesson or sporting event or doctor’s appointment, we can use those blocks of time and still get school done. Teaching Textbooks 3.0 works on MAC, Windows, and Chromebook. It also works on tablets and phones via the Puffin browser. That time on the road or time just waiting can now be more productive! With Teaching Textbooks 2.0, the student would have to use the same computer whenever they did math so that the grade book would reflect all of their work and be up to date; with Teaching Textbooks 3.0, you aren’t confined to one computer and I (or my husband) can log in from anywhere and look over the grade book. Above are the many reasons that I feel Teaching Textbooks is a great option for large families, but there are some additional features and important information I think you should also know about Teaching Textbooks. Teaching Textbooks offers free placements tests on their website. It is very important that you have your child take a placement test to ensure that you are purchasing the right level for them. Teaching Textbooks allows students to get a hint if a problem is tripping them up and it also gives them a chance to try the problem again if they get it wrong the first time. With the new 3.0 version, parents are able to turn these features on and off. When you purchase the Teaching Textbooks 3.0 online subscription option, your child will have access to one level of math for 12 months. But sometimes the school year just doesn’t go as planned and you might need to take some time off. If you need to, Teaching Textbooks allows you to pause your 12 month subscription for up to 90 days total. This way you can take breaks or vacation and not lose any of your subscription time. When purchasing a new curriculum, there is always that thought of ‘what if it’s not a good fit’ running through a homeschool mom’s head. Thankfully, Teaching Textbooks allows you to try the 3.0 version before you buy it! 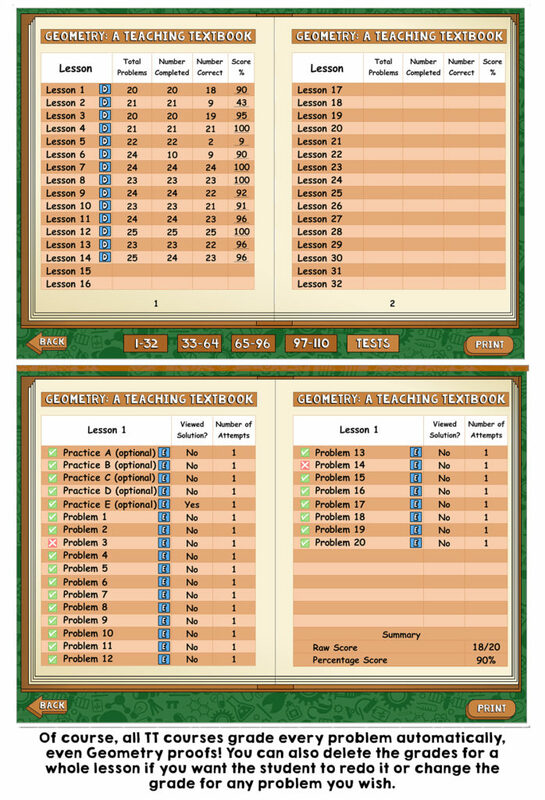 You can try lessons 1-15 in any of the levels of Teaching Textbooks 3.0 absolutely FREE. And, this trial never expires, so take your time. If you decide to buy, the lessons that were completed in the trial will be transferred over to your account so that no information or grades are lost. If you have questions about the free trial, click here. If you have additional questions about Teaching Textbooks in general, click here. 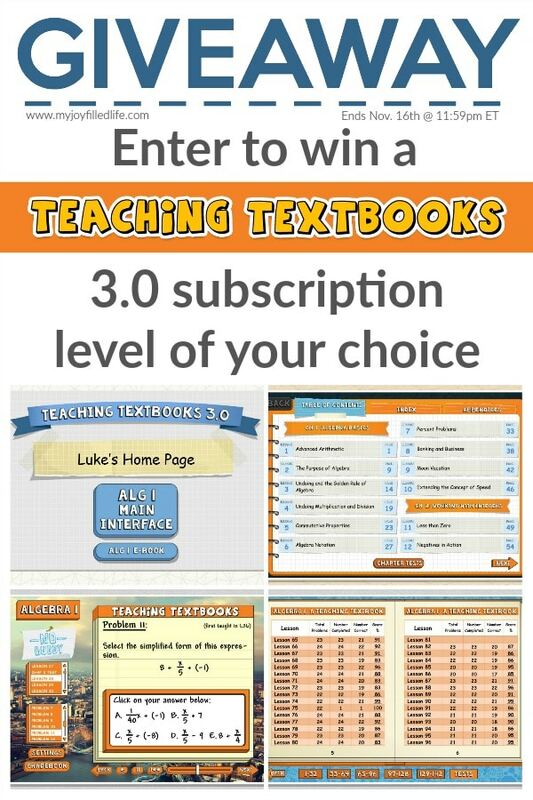 Use the Rafflecopter form below to enter for a chance to win the newest version of Teaching Textbooks! We have been wanting to try this and now is perfect opportunity!! Same here~!~ Love the FREE Trial! This is great. I love TT. Thank you for the opportunity. I have a question about teaching textbooks, if I need to print out some of the ebook (like if I want my child to work on some of the problems on paper vs on the computer, or if they need extra practice by doing some of the book) is printing possible? I found this on their FAQs page – Yes, you can print individual lessons, whole chapters, or the tests by logging into the parent account. Click the button that says, “View and Print Student Textbooks and Answer Keys.” From here you can print whatever you want. This is so great!!! I hope to win! hahaha. I have 4 homeschoolers soon to be 5… Not having to grade sounds incredible! We’re trying Teaching Textbooks online for the first time with our 3rd-9th graders. Loving it so far! Automated grading, ease of instruction, and mastery of each step is a must. It’s important to me for the math we use to be a good fit for my kids and for them to actually be learning and understanding what they’re being taught. Most important is user friendly. Love this! Whether we win or not, this resource looks like it would be fabulous to use with our multiple kids in multiple grades. Seems similar to abcmouse.com when they were younger. Although honestly, my oldest who is 8 still enjoys using abcmouse.com (along with my 5 and 7 year old…my 2 year old is just watching their videos right now). That they actually DO the lessons and complete the curriculum. Self-grading on TT helps me easily monitor each child’s progress. Something that they actually enjoy! Engaging and a good math teacher is important. While I am getting better at math after teaching for 9 years, my skills stop at algebra one. I always struggle with how to explain the lessons. This would be perfect! It’s important to me that the math be hands-on, fun, and include math relevant to every day life. Thank you for this opportunity!! We love TT!! I love Teaching Textbooks and hope to transition all my kids to it soon. Its important that it explains how to do the problems well. Engaging lessons that are well explained with little prep time for me is what I look for in math curriculum. I don’t mind having to give an explanation here and there, but do prefer when the curriculum does a good job of making clear what is expected. Thank you for a great give away. That I can use it for multiple children since I have eight. The thing I look for in a math curriculum is the quality and ease of teaching it. The most important thing when choosing math is if it’s going to challenge my children without stressing them to the max. The most important thing for me when choosing a math curriculum is that it is one that will work for my kids. My daughter loves the Teaching Textbooks 3.0 format! To win a free year would be such a blessing for us. The most important things for us is a curriculum that is easy to follow, gets straight to the point, and does not have hours of “busy work” to complete. Teaching Textbooks fits all of that for us. 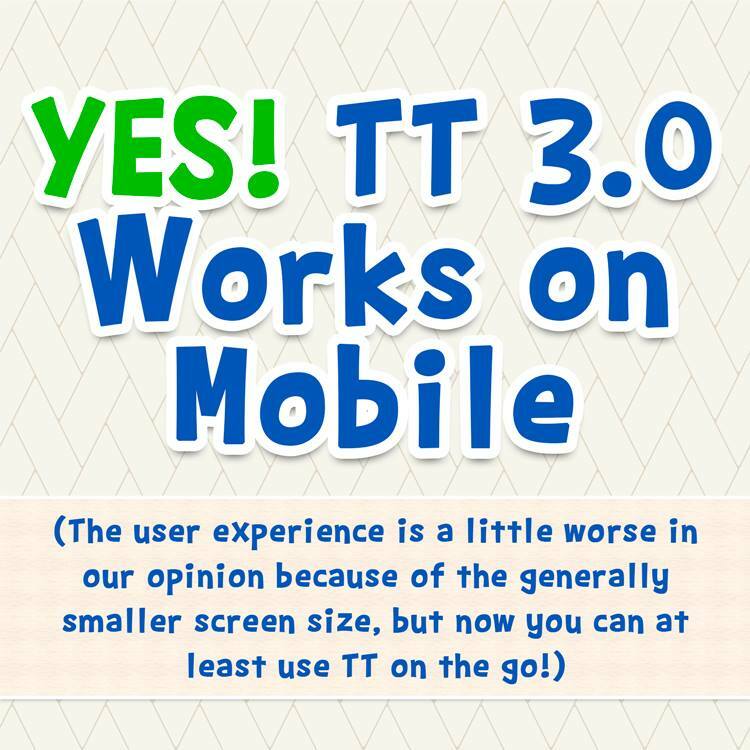 would like to try tt! We used Teaching Textbooks for the first time this year. We’ve had no tears which is amazing! Easy to use is our most important quality in a curriculum. And Teaching Textbooks is definitely easy! I love Teaching Textbooks. Is this where I enter for the giveaway? I couldn’t click on the picture. Thanks! Been wanting to try this for a long time, Thanks! The most important thing for us when choosing a math curriculum is fairly simple, if its Teaching Textbooks, then we’re good! We’ve used TT for the last three years and have loved it! My kids are excelling and I don’t have to worry whether or not I’ll be able to understand enough to teach it. I like a math curriculum with clear explanations and short lessons. Teaching Textbooks does a good job of this! I want a math curriculum that really explains the concepts and gives plenty of support/models for understanding. Lets be honest, something digital definitely sounds appealing, video support, keeping track of grades to really pinpoint where the child struggles, etc. The print option for etc non screen practice is nice too though! Being new to homeschool, choosing curriculums has been the biggest hurdle! We’d love to win this giveaway, but I’ll give the free trial a spin either way! We currently are using the online version with one child almost ready to move to another level. It wold be fabulous to not have to purchase the next one. We have used teaching textbooks dvds for many years. They have been such a help! My daughter who was STRUGGLING with math has found a program that really works for her. I love how it does the grading and lets me know whether or not the kids looked at the explanations when they get a question wring. I would love to try the new program that we could use more flexibly. Teaching Textbooks is the best math we have ever tried — and that was the 2.0 version! I think the online version would be simpler to keep up with. It would be nice to have the dates of completion in the grade log though as I like to assign grades on a daily basis. This came at the right time, Now let’s hope I get it :). that the program teaches and challenges my child! I think the most important thing for a math program is that my child enjoys it and can understand it. Math has always come easily to me but I must not be that good at it because I sure can’t seem to teach it to my oldest daughter in a way she can understand it! Thank you for the chance to have TT! My kids love math and cat h on really quick to new concepts, so this could be a great help them to get most of it done without me needing to teach it all to them. I too am a mother and a teacher of 8 children. Finding ways to teach each child all the subjects has been challenging to find a system that works for everyone. I am very interested in trying out this math.